Have you ever wondered how Google manages to bring the most accurate results for every search you make? Speaking from a spectator’s point of view, it seems as if Google is God. It defines accuracy at its finest feature and provides the user with solutions to every query within a few clicks. The most relevant sources get listed automatically at the top amongst a crowd of million websites. So how does this miracle actually take place? Well, to understand the entire concept in a simple one line, Google incorporates effective ranking algorithms for refining gazillions of websites that are available over the internet. When a person enters a particular query in the search box provided by Google, the algorithms come into play the very next second when a person hits the enter button. Ranking algorithms are computer programs that look for hints that match the query entered in the Google search box. When you search for information on a particular subject, on an average at least thousands of websites shall be bearing tons of relevant data to satisfy your need for information on the subject you are looking for. However, from a user’s perspective, they only tend to seek sources that have relevant information and not millions of web pages. Google algorithms directly get to the distillation process wherein it examines the word entered in the search box and brings up effective, relevant and accurate results to the top. 1. Websites that have been affected lately after the Panda update can still manage to grab a spot in the top, if the portal consists of web pages of higher and better quality. The Panda rank filter shall continue to suggest such websites for more detailed queries however the visibility shall be reduced under cases where the site owner’s benefit is not in proportion to the user’s benefit. 2. 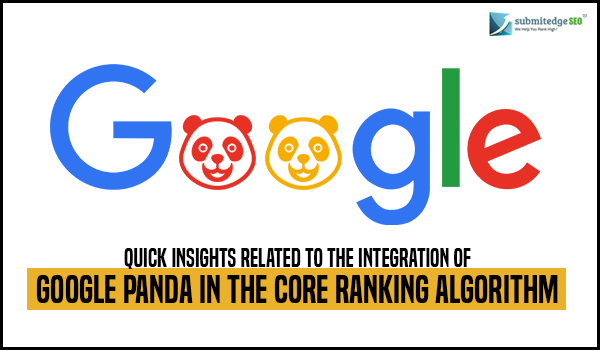 If you firmly believe that Panda will pull your rankings down then you can make use of the search console search analytics feature to identify the flaws that usually lead to piling of vague information. Once you spot all the redundant data present on your website, you can work on them and make the data more accurate and user-friendly. It is recommended for website owners to restrain from deleting those pages and to focus more on controlling the quality and prevent it from being tainted. 3. A secret tactic that can help you improve you ranking under the eye of Panda is to place more focus on being useful rather than maintaining the statistics that focus on the hike in visitors.